BLYTH – If the secret to a successful play is for the audience to see a bit of themselves reflected in the characters, then Mary’s Wedding at the Blyth Festival should be a box office hit. Every senior citizen – that age demographic that is predicted to soon comprise the majority of the population in Huron County – will surely be able to see themselves, or at least wish it for themselves, in the two young lovers whose sweet romance is interrupted by the start of World War I. And certainly, the audience for the matinee performance on Tuesday was a sea of grey-topped heads that hummed and tapped along to familiar-to-them wartime songs that played while they waited for the performance to begin. The story itself is pretty standard stuff. Girl meets boy of lower social status. They have an adventure and fall in love. They get separated by life’s circumstances, yet continue to try to get back to one another. And yet, playwright Stephen Massicotte has taken this simple story and given it classic elegance, with a crisp script, clever handling of timeline, and repetition of phrases about fear and regret in the dialogue that serve to drive home its messages. 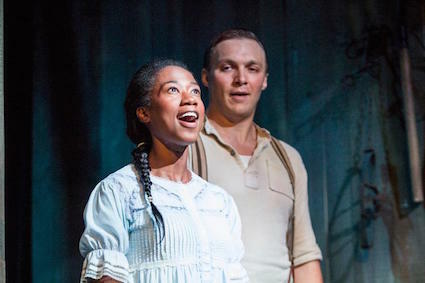 Sophia Walker, as the high-spirited new girl in town, Mary, is an incredible force on stage. She is entirely and equally believable as a precocious young woman who sees every bit of life as a great adventure or as a gruff and compassionate military sergeant. Eli Ham, as the dirty farm boy with a sense of duty to country, Charlie, is a competent actor who’s strong enough to share the stage with Walker, but gets less opportunity in his role to really shine. There are a number of lovely scenes where the two actors seem to be completely in synch with each other, as Mary reads from his letters while Charlie lives war experiences like being shot in a skirmish and riding full throttle into a line of Germans. Director Gil Garrett has fully and effectively carried the audience through a story in which they could easily become lost if it weren’t well executed. There are also a few really creative elements on the set, including a unique horse that you’ll have to see for yourself. The setting for Mary’s Wedding spills far beyond those pieces of polished wood where the drama of this wartime romance unfolds. Although the acting is restricted to the stage only, it’s complemented by the building that is home to the Blyth Festival, a structure called Memorial Hall that was built by the will and spirit of the community to commemorate its fallen during the First World War, and by the nearby small white building that serves as the social centre for the Royal Canadian Legion Branch 420 and its ladies’ auxiliary, both of which are sponsors of this theatrical production. This is a play with relevance to the community. If you want to see a play this summer that allows you dream, then Mary’s Wedding is it. Mary’s Wedding runs until Sept. 12. Tickets are $30 & $34 for adults and $15 for youth. Tickets may be purchased at the online box office; by phone at 519.523.9300 or 1.877.862.5984 during box office hours: non-performance days 9 a.m. – 5 p.m., evening performance days 9 a.m. -9 p.m.; in person at 423 Queen St., Blyth; or by mail with cheque or credit card information and including a $4 service fee to Blyth Festival, Box 10, Blyth ON, N0M 1H0. After a year of scanning, digitizing, formatting and researching, the Henderson Digitization Project is online! The project shares over 850 photographs taken by Goderich photographer, J. Gordon Henderson, at WWII Air Training Sites in Huron County. If you don’t know about this part of Huron County’s military history, here’s a quick backgrounder. 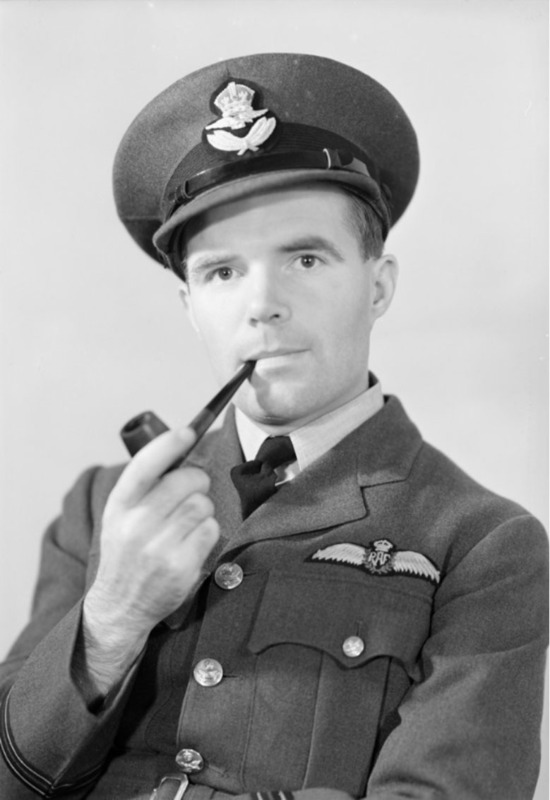 The British Commonwealth Air Training Plan (BCATP) aimed to quickly increase the number of pilots, navigators, bomb-aimers, wireless operators, air gunners and flight engineers able to fight in the war. The agreement was signed by Canada, Great Britain, New Zealand and Australia on December 17, 1939. Under the BCATP, over 90 training schools were opened across Canada, graduating more than 130,000 people between 1940 and 1945. Four of these training schools were established in Huron County, No. 9 Service Flying Training School (Centralia), No. 12 Elementary Flying Training School (Goderich), No. 31/ No. 5 Radio School (Clinton) and No. 31 Air Navigation School (Port Albert). The Henderson Digitization Project tells the story of daily life at these training sites. Photos are varied and capture group and individuals in both posed and casual settings. Daily life is also captured, including weddings, funerals, parties, training and flight. I find it really exciting that these negatives have been turned into photographs and are now easily found online. A quick flip through gives a sense of who the men and women were that worked at these air training sites and may have travelled to Huron from the other side of the world. The Huron County Museum has been contacted by individuals from as far away as the UK who have ties to the base. The photos can be accessed at http://digital.huroncounty.ca, and can be searched by keywords, categories or as a whole collection. The Museum is asking for help from the public to identify some staff and trainees or provide additional details. There is also a blog that provides additional details and stories behind the project and photos. It can be accessed here, http://blog.huroncounty.ca/museum.